K.T. Shanmugam’s research focuses on ways to convert waste crops into ethanol, a renewable source of transportation fuel. Shanmugam plays a crucial role in the UF Florida Center for Renewable Chemicals and Fuels, where he has led the effort to genetically engineer bacteria for more efficient hydrogen production. He is also involved in making microbial fuel cells for electricity generation. 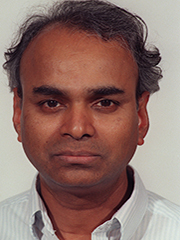 Shanmugan has been principal or co-principal investigator on more than $6 million in grant support from the U.S. Department of Energy and other agencies over the last five years.